What every child wants, more than anything else, is to be a superhero. To save lives like their favorite big screen superstar, to fly like Superman and scale buildings like Spiderman. Little girls hope to be Catwoman and little boys hope to grow up to be as cool as the Green Lantern. While you might not be able to turn them into a child with real superpowers, you can make their superhero dreams come true with a great superhero costume this Halloween. Got a kid who can't get enough of Spiderman? Scrawny Peter Parker has become a well-recognized superhero, thanks to multiple movies and many more comic books, which means that many a little boy wants to string spiderwebs along walls and climb buildings with little to no effort. 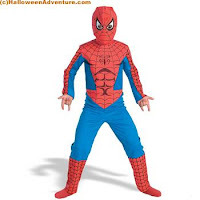 Our official Marvel Spiderman costume is a great option for kids who can't get enough of Spidey. A red and blue bodysuit that's so close to the movie version you'll swear your child has walked onto a Hollywood set, this costume is sure to please even the most difficult child. Another fan favorite of little boys is the role of the Dark Knight, played by the late Heath Ledger, in the latest Batman movie. Our Batman Dark Knight child's mask is so spooky you'll swear that the Dark Knight's ghost has come back to haunt you and your home. This vinyl masked is officially licensed, so it's as close to the real thing as you can get. Plus, because it comes ready-made, you'll save hours in the makeup chair. 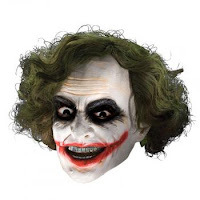 Of course, if the Dark Knight himself isn't your child's style, we've also got great Joker and Batman masks as well. Last but most certainly not least is a costume that doesn't exactly belong to a superhero - instead, it belongs to a wizard. That's right, we're talking about The Boy Who Lived, the famous Harry Potter. 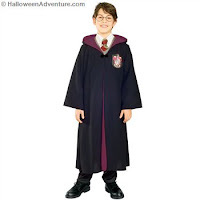 Our Harry Potter costumes seem to fly off the shelves year after year, and for good reason - everyone loves their favorite wizard. Deck yourself out in a Gryffindor robe and get a matching one for your young child and you'll be ready to take on the witches and warlocks of Halloween!